With an abundance of on-mountain cafes and restaurants, the days of gnawing a frozen candy bar on the chair lift are long gone. 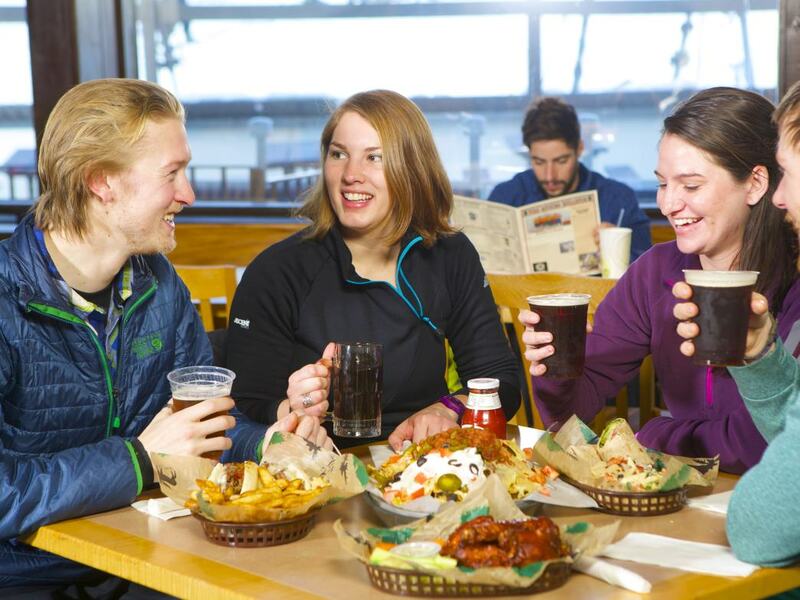 After an invigorating morning on the slopes, glide over to the Sugarhouse Cafe for a pick-me-up. Just uphill from the Starburst Six Chairlift, the Sugarhouse dishes up Vermont specialties, hot soups, and custom made deli sandwiches, and even offers a Thai noodle-bowl station. 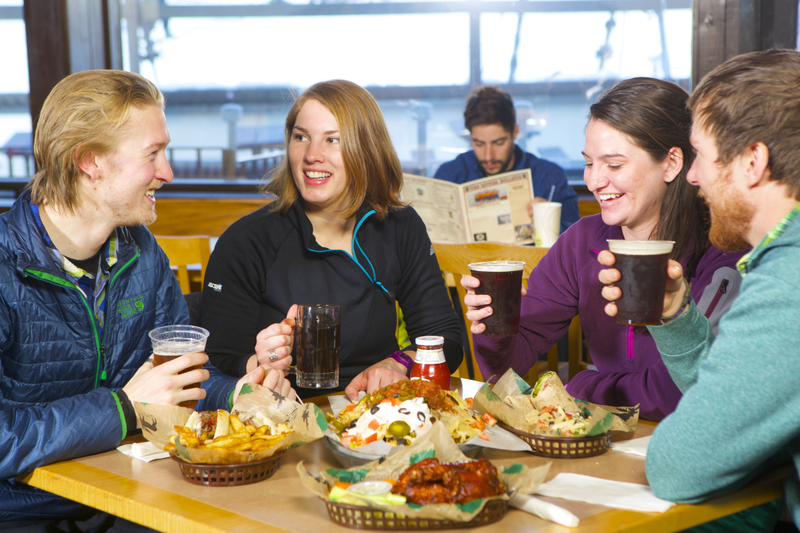 For slopeside staples, take a seat on the heated deck at Smokey Joe's Outdoor BBQ for a basket of wings and a Long Trail Ale. If you're feeling indulgent, Epic at Solitude serves up artisan lunch fare. Choose from small plates like the Parisian style gnocchi with winter vegetables, or buttermilk-fried chicken in a Vermont maple glaze. The Epic Umami Burger truly lives up to its name, with prosciutto, shiitake mushrooms, a cheese fritter, and a double beef patty piled on a brioche bun. If you'd rather grab and go, the Deli at Epic serves up wraps, cider donuts, seasoned fries, and New England clam chowder. After last chair, local powder hounds can be found gathered around the bar at the Loft Tavern, a rowdy place filled with juke-box tunes and ski-bum bartenders. Here you'll find the lowest prices on the resort, the best beer selection, and a great burger—the aprés ski holy trinity. The newly renovated Sitting Bull Bar and Restaurant in the Clock Tower base lodge is another hot spot where you can enjoy heaping plates of nachos and live music on Saturday afternoons. If you're looking to settle in for a full evening of dining and spirits, a world of indulgence awaits at the Jackson Gore Village. Kick off the night with a stop at the fireside Coleman Lobby Bar for a white chocolate martini or a s’moretini with a graham cracker rim, shaken up by the creative mixologists behind the bar. In the mood for something straight up? Choose from a broad selection of liquor that includes single malt scotch, single barrel bourbons, and cognac. The Coleman Brook Tavern features contemporary gourmet dining, with fresh modern entrees like Vermont maple siracchi ravioli or grilled fillet minion with black truffle potatoes. An eclectic dessert menu includes tropical mousse frozen in a white chocolate cage, ice cream bon-bons, and do-it-yourself s’mores roasted over a tabletop fire. Coleman Brook also features a wine room, an intimate dining area exclusively for adults and private parties. The wine collection, which includes 7,000 bottles and 800 different varieties, has been awarded the Wine Spectator’s Best of Award of Excellence. Also in the Jackson Gore Village, Siena brings the taste of Tuscany to the Green Mountains. The menu features classic Italian comfort foods like chicken parmesan, ravioli, and Tuscan short ribs that are sure to please the whole family. The dishes are cooked in an open kitchen and served in a cozy and casual dining room. 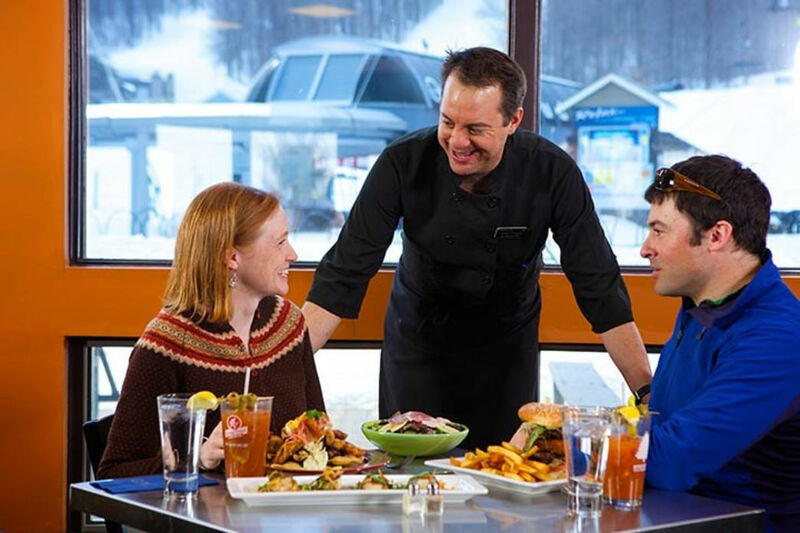 For an exquisite dining experience in an unforgettable setting, don't miss the Snowcat Dining Adventure. Travel by Snowcat across the mountain from Jackson Gore to Epic at Solitude, where you will be served a five-course meal beside a roaring fire. The chef creates two brand new menus each week specifically for the occasion. The "Indulgent" menu is bold and exciting, using only the finest local and seasonal ingredients. The "Spa" menu features lighter creations, with an emphasis on health and wellness. Each of the five courses is paired with a different wine, personally selected by the mountain Sommelier. 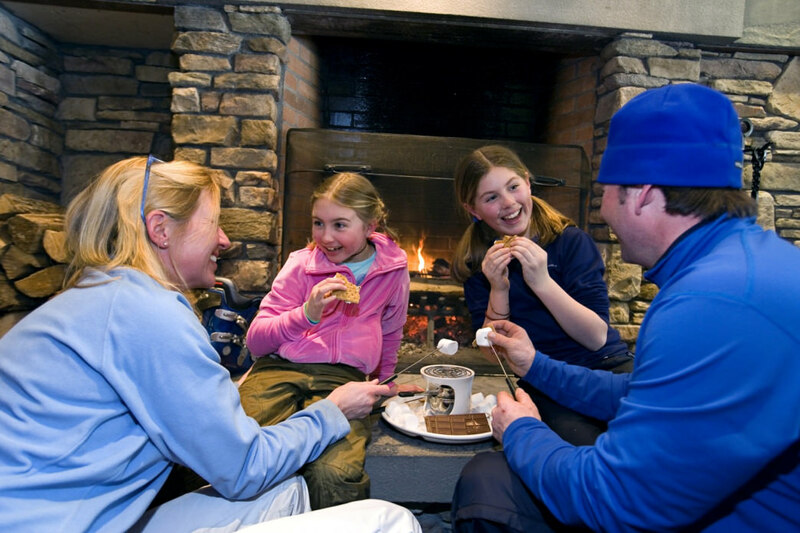 At Okemo, the après-ski experience extends far beyond exemplary food and drink. The Spring House is a fitness and aquatic center, centrally located at Jackson Gore to help you achieve a seamless transition from ski boots to steam room. Go for a swim beneath the stars in the heated outdoor pool, and savor the blissful feeling as your snow-chilled muscles begin to relax. Top it off with a long soak in the hot tub or a few quiet moments in the sauna. Just steps away from the Spring House, the spa treatments at Jackson Gore Village are the ultimate aprés luxury. The facials and body scrubs sound nearly as delicious and indulgent as Coleman Bar's craft cocktail menu. The Vermont Maple and Brown Sugar scrub is a sweet and aromatic foaming scrub that gently exfoliates, leaving you with smooth skin and a rosy post-powder glow. The lavish Chocolate Lover’s Dream facial uses powerful antioxidants derived from pumpkin, pomegranate, and chocolate to leave your skin purified, detoxed, and deeply hydrated. Pamper yourself with a blissful and restorative massage, a gift to your body after a demanding day on the mountain. Whether it's Swedish, deep tissue, or hot stone therapy, your muscles and joints will reach a state of deep relaxation, while a sense of calm and balance is restored to your mind. If you’ve been carving endless turns since first chair, a sports massage combining deep tissue techniques with precision muscle stretching will help to alleviate tightness and muscle soreness, so that you can return to the slopes in optimal condition, ready for another full day of crushing.